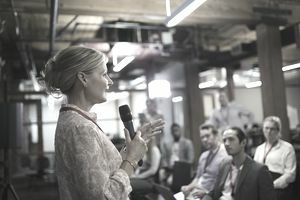 Many small business owners often consider turning to public speaking in order to boost their credibility as an expert and get themselves and their businesses in front of large crowds. The challenge? Fear of public speaking is one of the most common phobias in today's society. In fact, 75% of individuals suffer from this fear. Add to that any personality traits that make public speaking even more difficult — like being an introvert — and you have a tremendous challenge on your hands. The good news is that it is possible to deliver a strong and memorable presentation, even if public speaking is way out of your comfort zone. It all boils down to preparation, practice and building up your confidence. Try the tips below to fine-tune the delivery of your next public speaking presentation so you can completely knock it out of the park. Every presentation requires a different approach. This is why it is vital to really get to know your audience so you can adjust your content and format into one they will respond to. For example, a presentation to a group of experienced business owners will be much different from a presentation to a group of aspiring high school entrepreneurs. Find out who will be in your audience and make sure you create a message that speaks to them. The best presentations are those that get the audience fired up and motivated to do something awesome. How do you make this happen? Start by making your presentations visually appealing — remember what you say and how you say it is more important than what you put on the screen. Know what your primary message is and drive it home with passion and excitement. And don't be afraid to ask questions, pull audience members up on stage, and make it a full participation event. I know the traditional way to deliver a presentation is to create a 25-slide Powerpoint with 3-5 bullets on each slide, then just talk your way through it. That doesn't fly anymore. Now, it's all about engaging your audience, creating Twitter bites, and making it memorable. Stop using your PPT as a crutch to get to the end, and focus on talking to your audience members personally. Humor often diffuses. It can make you less anxious about presenting while at the same time making your audience feel connected to you. I know, not everyone can flip on the funny at a moment's notice, but if you incorporate a little levity into your presentation, you are sure to draw people in. No matter how much experience you have giving presentations, everyone gets butterflies from time-to-time. This can be intimidating but think of these butterflies as a tool to make sure you are present and focused during the entire presentation. You may also be able to squash the nerves by thinking about how good you will feel once your presentation is over. One trick that works for me pretty consistently with any type of presentation is practicing... a lot. The more you know your stuff, the more comfortable you will be. And the more comfortable you are, the more confidently you will deliver your presentation. That's one major part of delivering a powerful presentation. Just remember to make it natural and conversational instead of reciting a script you memorized. Not everyone is comfortable being in the spotlight, and not everyone has an immediate need to embrace public speaking. But remember that the tips above can be helpful even in day-to-day small business networking. If you're not prepping for a presentation, try using the tips above to psych yourself up for your next networking event, or to improve the delivery of your elevator pitch.